New Year's Eve brings us the second of two full moons for North Americans this month. Some almanacs and calendars assert that when two full moons occur within a calendar month, that the second full moon is called the "blue moon." The full moon that night will likely look no different than any other full moon (other than the fact that a partial eclipse will occur across most of Europe, Africa, and Asia). But the moon can change color in certain conditions. After forest fires or volcanic eruptions, the moon can appear to take on a bluish or even lavender hue. 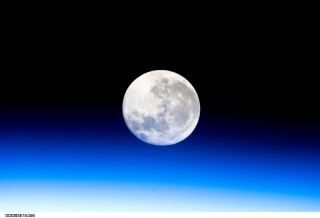 Soot and ash particles, deposited high in the Earth's atmosphere, can sometimes make the moon appear bluish. In one example, smoke from widespread forest fire activity in western Canada created a blue moon across eastern North America in late September 1950. In the aftermath of the massive eruption of Mount Pinatubo in the Philippines in June 1991 there were reports of blue moons (and even blue suns) worldwide.? For the longest time no one seemed to have a clue as to where the "blue moon Rule" originated. Many years ago in the pages of Natural History magazine, I speculated that the rule might have evolved out of the fact that the word "belewe" came from the Old English, meaning, "to betray." "Perhaps," I suggested, "the second full moon is 'belewe' because it betrays the usual perception of one full moon per month." But thanks to a couple of misinterpretations of this arcane rule, first by a writer in a 1946 issue of Sky & Telescope magazine, and much later, in 1980 in a syndicated radio program, the second full moon in a month is the one that's now popularly accepted as the definition of a "blue moon."?? This time around, the moon will turn full on Dec. 31 at 2:14 p.m. Eastern Standard Time (11:14 a.m. Pacific Daylight Time). But for those living in central and eastern Asia, as well as Australia and New Zealand, that same full moon occurs after midnight, on the calendar date of Jan. 1, 2010. So in these regions of world, this will not be second of two full moons in December 2009, but the first of two full moons in January 2010. So, if (for example) you live Perth or Tokyo, you'll have to wait until January 30 to declare that the moon is "officially" blue. This week's full moon will also undergo a partial eclipse. The moon will dip slightly into the Earth's umbra ? the dark, hard-edged shadow ? which will show black or dark brown on the moon's southern limb for just over an hour; this will be a pre-midnight New Year's Eve show for Europe, Africa and western Asia, while for central and eastern Asia, Indonesia and western and central Australia this will happen in the post-midnight hours of the first day of 2010. Maximum eclipse will come at 19:23 UT, when just 8.2-percent of the moon's diameter is within the umbra. The last time a blue moon coincided with New Year's Eve was in 1990. The next opportunity will come in 2028.